Welcome to October. HAZMAT is every first responder’s nightmare. The response area is hard to contain, disbursement of the substance can mean a large affected area. Weather can be a factor. Things we cannot control. And face it, we want to be in control. This month, we offer some articles and resources to help you prepare for the HAZMAT response. If your community has a railway or roads where trucks readily drive through, you are at risk for a HAZMAT incident. We have a great perspective in HAZMAT: A Rural Department’s Deputy Chief Perspective, by Deputy Chief Rick Vriesenga of Bowne Township, Michigan and an article on the particular hazards posed by fertilizer plants in They’re in North California and South Alabam’ and Little Towns All Around This Land: Fertilizer Plants as Potential Hazards by Mike Kennedy. Retired Battalion Chief Robert Avsec also weighs in to remind responders of the real dangers on the fire scene in, Every Working Fire is a HAZMAT Incident. And don’t Miss our Spotlight on Technology: AWOGS by Firefighter/ Paramedic Steve Williams of Fulton County Fire, Georgia, with a product used by over 400 fire departments to help keep firefighters safe. Finally, our At the Resource feature, which has FREE training courses on different HAZMAT areas. And make sure your department has CAMEO software, free from the Environmental Protection Agency! 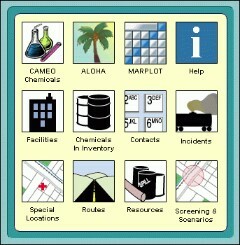 The CAMEO Chemical database is available for mobile devices. Critical resource for any potential HAZMAT response. Enjoy the issue and have a safe and fun October! While your trick or treaters may be dressed as Batman or Wonder Woman, remember, you are the real Superheroes. We are here for you, free online, to keep you At the Ready.